For countless generations, parents have swaddled and cared for their children with natural muslin. aden + anais� continues this tradition with the classic muslin swaddles. The breathable fabric helps reduce the risk of overheating, while the signature prints and solids complement your unique style. 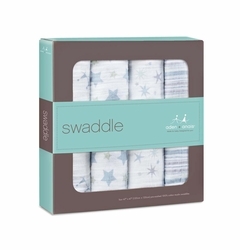 Four 47" x 47" pre-washed 100% cotton muslin swaddles are included in the boxed set. Perfect for a baby shower or homecoming! We have blankets to keep baby warm and cozy as they sleep and blankets that provide a clean safe surface for them as they play. 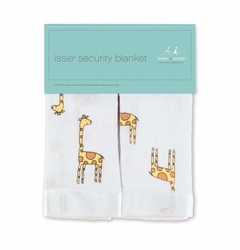 Muslin swaddlers and sleepers help comfort baby without overheating and come in very cute designs. Stroller blankets provide snuggly soft warmth as baby rolls around town and travel blankets are perfect for the beach, park or any outdoor venue. Be sure to check out the Belly Armor blankets that block low level radiation that is emitted from electronic devices...perfect for pregnant moms who use cell phones, tablets and laptop computers and great to use for small children who also use these devices on their laps.